It’s five years after Return of the Jedi: the Rebel Alliance has destroyed the Death Star, defeated Darth Vader and the Emperor, and driven out the remnants of the old Imperial Starfleet to a distant corner of the galaxy. Princess Leia and Han Solo are married and expecting Jedi Twins. And Luke Skywalker has become the first in a long-awaited line of Jedi Knights. But thousand of light-years away, the last of the emperor’s warlords has taken command of the shattered Imperial Fleet, readied it for war, and pointed it at the fragile heart of the new Republic. For this dark warrior has made two vital discoveries that could destroy everything the courageous men and women of the Rebel Alliance fought so hard to build. The explosive confrontation that results is a towering epic of action, invention, mystery, and spectacle on a galactic scale–in short, a story worthy of the name Star Wars. 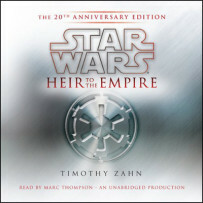 First book of Timothy Zhan’s The Thrawn Trilogy.